Every other day a new smartphone hits the globe and gets super hit in the market because the demand of the cellular devices is expanding and escalating with every passing hour. Even you will notice people who don’t stick to one smartphone, rather they keep on buying new ones and also keep the old ones intact. Sometimes I wonder, where do the old phone go? They might either get tattered or rusty/dusty in the drawers or dying in our old cupboards. Well you can always give them away to downtrodden or servants so they can use them before these smartphone get expired or breakdown. Some people switch from one to another smartphone as if they are changing a t-shirt. Even buying an expensive phone for a rich person is not a big deal because he cannot compromise on his looks and personality that’s enhanced and amplified by the smartphone he uses. The reason to this is basically the standard and technology which is now some other level of perfection. Any feature if goes missing in our phone, we become way too curious and start to save money so to buy the new phone in future and turn the old one down. Under the big names and bigger banners we can entrust hope and we blindly follow them because they don’t disappoint us. 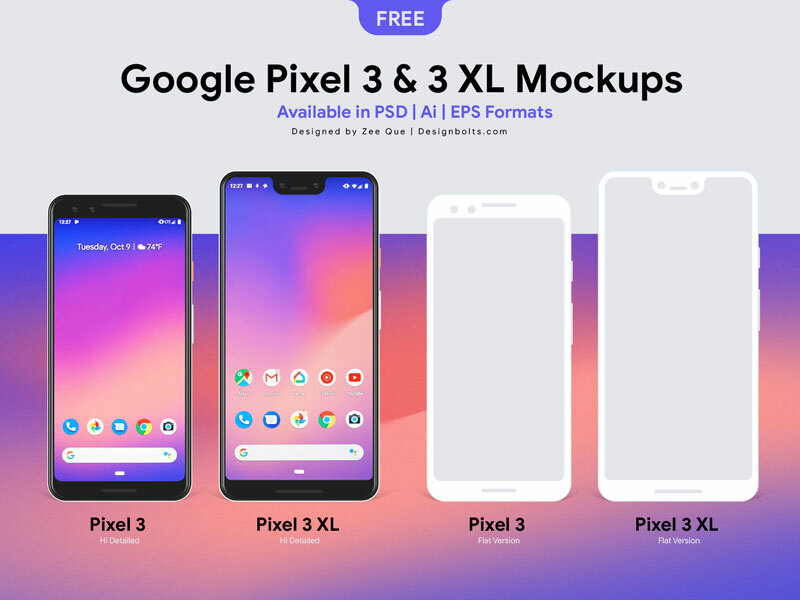 Previously, we shared Google pixel 2 mockups and today you will download free Google Pixel 3 & Pixel 3 XL mockups in PSD, Ai & EPS. The Google Pixel 3 and Pixel 3 XL are phenomenally photos with several software yet hardware updates. They are usually considered camera phones because of the most famous pixel 2 camera still the best amongst competitors like Apple. Coming back to our freebie these mockups can be utilized for commercial/personal projects. You just have to put the image, font, wallpaper or app design into the mockups and it will serve more like a presentation. So are you going to get your hands on any of the new Google Pixel phones or not? Let us know about your interest and feedback so we can arrange more technology related stuff for you all in future as well. Here we go with a bang.